Take your family jogging with the Baby Trend Navigator Lite Double Jogging stroller that can accept two baby trend car seats (sold separately). Made for two children, this jogging stroller features composite tires and a locking front swivel wheel that allows you to keep the front wheel in place while jogging. If you're out for a leisurely stroll, simply unlock the front wheel for greater maneuverability. For your convenience, the parent tray includes two cup holders and covered compartment storage. 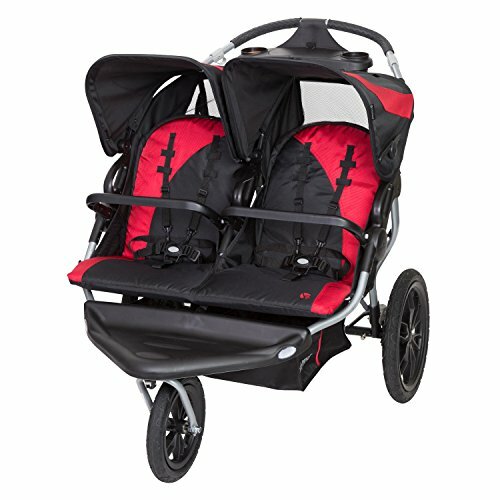 For your children's comfort and safety, the double jogger features a ratcheting shade canopy, a multi-position reclining seat and an adjustable five-point safety harness. Store your children's necessities in the large storage basket, and you're ready to roll. Know you're traveling safely in this sturdy, lightweight double jogger that's certified by the juvenile products manufacturers association. At the end of your trip, quickly and easily fold the stroller into a compact unit. 46 x 31.5 x 42 recommended use: children up to 50 lbs.